Behind the scenes look, courtesy of RC4 Wireless Dimming. From November 16th through January 1st, Lightwire Theater was proud to be a part of The Dallas Zoo Lights presented by Reliant. For twenty-one nights, we roamed through the massive crowds with our two friendly “schweeta” birds and one very large bird named “Tara”. There were plenty of “wows” and lots of laughs as our characters played with Santa and took photos with young and old alike bringing joy to the holiday season. “Lightwire was a BIG hit this year at our event”, stated Sean Greene and Carmon Hannold of Guest Experience. Many thanks as we were very grateful to show Dallas, Texas the magic of Lightwire! Last Friday evening, the Lightwire Theater cast donned their battery-operated costumes and amazed downtown Dallas onlookers with an 8-minute holiday performance in six of the historic Neiman Marcus windows. Observers followed Max, a baby Shweta bird, on his exhilarating journey to recapture a very special Christmas gift. Max ventured through a forest filled with toy soldiers, a mystic land of worms, and an evil Rat King's kingdom in an exciting story that is sure to warm hearts of all ages. You can catch this very special performance in the windows of Neiman Marcus in downtown Dallas, TX on Thursday and Friday evenings (and select Wednesdays) at 5:40 PM! Visit ww.attpac.org to purchase tickets to Lightwire's full-length performance of A Very Electric Christmas on January 1st, 2018 at 1:00PM and 5:00PM at the AT&T Performing Arts Center - Winspear Opera House in the downtown Dallas Arts District. We are honored to announce that Lightwire Theater will return to the historic windows of Neiman Marcus in downtown Dallas, TX this holiday season! Last year, Lightwire amazed onlookers with a mini performance of 'A Very Electric Christmas' in the Main Street window each evening for eight days. This year, Lightwire will tell a heartwarming story that transcends all six windows of Neiman Marcus! Observers will follow Max, a baby Shweta bird, on his exhilarating journey to recapture a very special Christmas gift. Max will venture through a forest filled with toy soldiers, a mystic land of worms, and an evil Rat King's kingdom in this exciting story that is sure to warm hearts of all ages. The pop-up window display will debut in the Neiman Marcus windows on Saturday, November 11th and live performances will begin on Friday, November 24th (Black Friday)! Check out this clip of Lightwire's window performance last holiday season! We have teamed up with The Cure Starts Now North Texas to raise awareness and money for pediatric cancer research! Kids are the reason we get to perform every single day, and we couldn't think of a more worthy cause to support. The Cure Starts Now is a 501C3 Federal Non-Profit Organization dedicated to finding the cure for cancer, starting first with one of the most deadly and difficult cancers: pediatric brain cancer. Since 2007, The Cure Starts Now has been one of the leaders in non-government funding of pediatric brain cancer research and a pioneer in the effort to find the cure to all cancers. The North Texas Chapter of The Cure Starts Now was started by our dear friend Michelle Bjornberg and her husband Steve in honor of their daughter, Sydney Reece Bjornberg. Sydney was a vibrant, beautiful, smart 11-year old girl who lost her life to DIPG, an inoperable brain tumor, one week prior to her 5th grade graduation. In the United States, 1 in 330 children will develop cancer by age 20. To show our support of pediatric cancer research, we are doing a very special performance Sydney's Band of Gold Gala on October 7th, 2017. Last year, this event raised over $160,000 for pediatric cancer research! We will also be donating $2 for every ticket sold to each of our New Years Day shows in Dallas at AT&T Performing Arts Center. For over three decades, the Northern Alberta International Children’s Festival has been a signature cultural event for the region. Building bridges between art, culture and education, the expansive five-day festival transforms downtown St. Albert (Canada) into a world where the only limitation is one’s imagination. Lightwire Theater performed their cosmic adventure story 'Moon Mouse: A Space Odyssey' at the festival and gave festival goers a close-up look at the homemade structures that bring Lightwire's magical characters to life. Check out the video below from CTV Edmonton News for a behind-the-scenes look! Lighwire has returned to China this year for the fifth time! Chinese audiences have fallen in love with the group's dazzling blend of cutting edge technology, puppetry, dance, and visual storytelling, and they are thrilled to be returning for another tour. 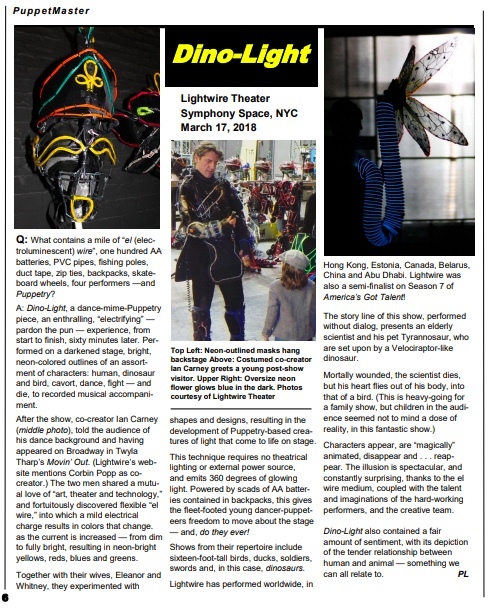 During their time in China, the Lightwire cast will be performing The Ugly Duckling at multiple venues across the country, conducting workshops and speaking at events. 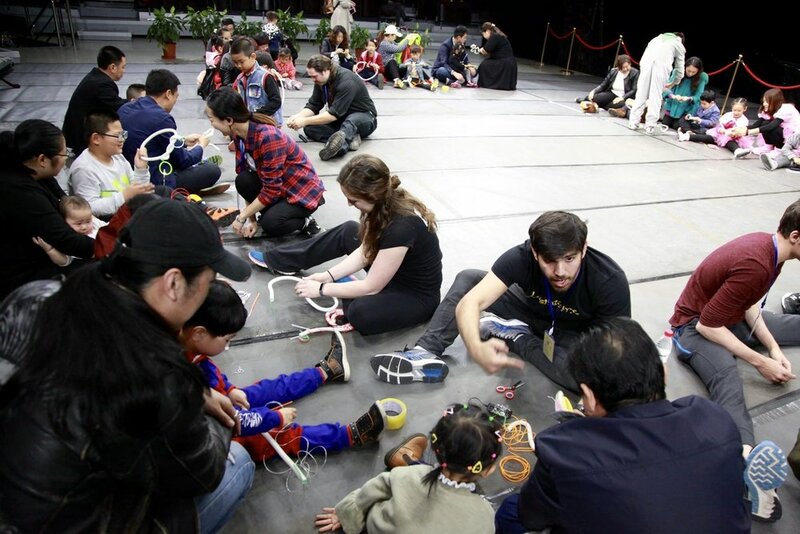 Lightwire Theater cast at the BuildingUp Workshop in Xiamen, China. Make sure you are following Lightwire's Facebook, Twitter and Instagram so you don't miss any of their adventures! Neiman Marcus Downtown has partnered with Lightwire Theater to present a unique and interactive window display beginning Friday, December 16, 2016 until Friday, December 23, 2016. Each evening for eight days Lightwire Theater will perform an exclusive mini performance of A Very Electric Christmas in the Neiman Marcus Main Street window. Repeating mini performances can be seen from 5:30 PM to 6:30 PM, December 16, 19, 20, 21, 22, and 23. December 17 and 18, Lightwire will perform from 5:00 PM to 6:00 PM. Check out a sneak peak of the window display below! Lightwire Theater will be a part of the 20th annual Electric Daisy Carnival (EDC) in Las Vegas, June 17th-19th! As the sun fades into night, Las Vegas Motor Speedway will be transformed into the expansive neon dreamscape that is EDC. Lightwire’s electroluminescent creatures will encounter thousands of people as they roam about the neon carnival, which Insomniac describes as “a distinct union of technology and nature”. Festival goers will explore interactive art installations, carnival rides, mind-blowing circus-style performances and more than 200 of the world’s top electronic music artists across 8 stages. With over 400,000 attendees last year, Electric Daisy Carnival is the largest dance music festival outside of Europe. Lightwire’s stunning neon creatures will be a perfect fit among the LED-filled carnival grounds, and festival goers will get to experience the magic of Lightwire Theater under the Electric Sky.